A native of Kingston, Jamaica, Ziggy Marley first sat in on recording sessions with his father's band, legendary reggae troupe Bob Marley and the Wailers, when he was ten years old. Joining with his three siblings to become The Melody Makers, Ziggy crafted his own soulful sound blending blues, rnb, hip-hop and roots reggae. After their first two albums, Play The Game Right (1985) and Hey World! (1986), The Melody Makers earned their first Grammy (Best Reggae Recording) for Conscious Party (1988), an album produced by Talking Heads Chris Frantz and Tina Weymouth which included the hit songs "Tomorrow People" and "Tumbling Down." Subsequent albums included the Grammy-winning One Bright Day (1989), Jamekya (1991), Joy and Blues (1993), Free Like We Want 2 B (1995), their third Grammy winner Fallen is Babylon (1997), Spirit of Music (1999) and Ziggy Marley & the Melody Makers Live, Vol 1 (2000), which featured some of their biggest hits as well as a cover of Bob Marley's "Could You Be Loved." While selling records by the millions and selling out countless concerts with the Melody Makers, including a recent European tour, Ziggy Marley has never lost sight of his foundation of faith, fellowship and family. After two decades as the driving creative force behind The Melody Makers, Ziggy stepped out on his own with his first solo album, Dragonfly (2003). Never content to rehash the success of his past, Ziggy uses Dragonfly to explore new ground and create his own distinctive musical identity as a solo artist. "Working on my own gave me a chance to take my time and experiment a lot," Ziggy says of the material on Dragonfly." It took one year to finish this record. It's the longest I've ever worked on a album. It's different when you on your own. At some point it's scary and then at another it's a drive that makes you focus more." Although the members of the most close-knit musical families often yearn to step out on their own, for Ziggy, a solo debut was not a long-awaited goal. "It's not something that I wished for since I began doing music," he says. "It was just the circumstances, and I wanted to be true to myself and what I feel. The record has strong messages and it feels good." In addition to being Ziggy's first album of solo material, for Dragonfly he felt it was time for a change of scene. "Usually we record in Kingston. These songs were written in Jamaica and recorded in America. I did the first set of recordings in a house in Miami and then went to L.A. rented a house, set up my equipment and basically did the rest there. I left Jamaica for a while, because as an artist I need to experience different things, to see the world and have different energies. Living in one place is not good for me and I was tired of making music in a studio setting. I wanted it to be more like everyday life a part of me. "As an individual, I've opened up more by traveling outside Jamaica, and I've been more able to be open to people and ideas. It helps me to grow as a person to be outside of my element; to be on my own in a strange place meeting people. That's good for me not to be in my secure domain." The evidence of that growth is everywhere on Dragonfly. On July 2nd, 2006, Ziggy released his second album, Love is My Religion. He states "This album is from my heart," and he feels that he embraces his spiritual and emotional side of life. This album show Ziggy coming into his own as an artist, as he wrote all of the songs for the album and played nearly all of the instruments. 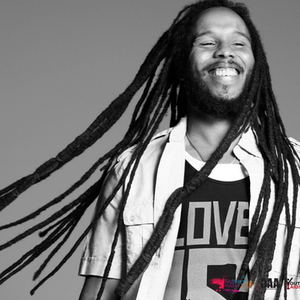 Love is My Religion is a testament to Ziggy Marley's talent as he follows in the footsteps of his father, the Legend.